I invite you to travel to that country that resembles you so much. Of your eyes when they shine blurred. Down there everything is order and beauty, calm and voluptuousness. The world falls asleep in a warm light of hyacinth and gold. Our personal wish is that you will be able to make a journey inside you, through your stay in this magnetic portion of Paradise. It will definitely be an extraordinary journey, a journey of the soul and of course…a good journey! Saint Francis reinstates the Harmony with the Cosmos. Hidden in the deep spheres of the human being of our day, the need for Reconciliation and Harmony, the Return to Nature, is deeply felt, and it is in this sense that the actuality and modernity of Francis' teaching must be understood. The philosophies and religions of India stem from a deep contact with Nature, felt as "Mother"; it is therefore understood why Francis was the Saint closest to the heart of India. - Basilica of Santa Maria degli Angeli in Assisi, containing the Portiuncula and the Chapel of Transit where he died. - The Shrine of Rivotorto at Rivotorto in Assisi, which contains the Sacred Tugurio, the first residence of St. Francis. Also known as the "poor man of Assisi," his tomb is a place of pilgrimage for tens of thousands of devotees every year. The city of Assisi, because of its famous citizen, has become a symbol of peace, especially after hosting the two great meetings between the exponents of the major religions of the world, promoted by John Paul II in 1986 and 2002, and by Benedict XVI in 2011. Today, St. Francis of Assisi is one of the most popular and revered saints in the world. In addition to the spiritual work, Francis, thanks to the Canticle of the Creatures, is recognised as one of the initiators of the Italian literary tradition. Francis perhaps sick, felt the need to retire to solitary places to restore himself and pray (places such as, the Hermitage of the prisons of Assisi, on the slopes of Mount Subasio, the Major Island on Lake Trasimeno, the Hermitage of Cells in Cortona). Between 1224 and 1226, by then seriously ill, he composed the Canticle of the Creatures. The inspiration of the Canticle is centred around the humble and joyful acceptance of all life that beats in us and around us, because it’s coming from a God who is joy, goodness, love, cannot fail to have authentic goodness and beauty. These are attested by all things: water, sun, earth, fire, flowers, stars, harmoniously arranged in this vast universe. Man can, therefore, feel the loving and paternal presence of God for the whole Creation and feel that all beings, born of one Father are brothers and sisters. Santa Chiara was an Italian religious, collaborating with Saint Francis and founder of the Poor Clares: she was declared saint by Pope Alexander IV in 1255. On February 17, 1958, Pope Pius XII declared her patron saint of television and telecommunications, and the main church dedicated to Clare is the Basilica of St. Clare in Assisi, where she is buried. Clare of Assisi can be defined as a woman "between silence and memory" for many reasons. The first is her personal story. In fact, Chiara chose to live her entire life in monastic silence. It is said that she, together with her sisters, had obtained the special grace of mortification and silence to such an extent that they have practically no difficulty in dominating the senses and slowing down the tongue. Some of them have become so unfamiliar with speaking that, when forced to do so by necessity, they almost forget the correct way of pronouncing words. On the other hand, Clare was one of the first women of the Middle Ages to have broken the wall of silence: while the vast majority of medieval women in the sources are mute, Clare's voice, through her writings, has reached today. In her encounter with Clare, Francis welcomed the feminine part of herself, her tenderness and Clare welcomed in her relationship with Francis the masculine part of her being, her strength. Both have thrown out the fear of each other. Francis was no longer afraid of being tender and became strong. Clare, weaving her relationship with Francis, developed her tenderness and became strong. Francis found in Clare her masculinity, her strength, and Clare found in Francis her femininity, her nourishment, her tenderness. The Subasio Park is made up of the mountain system that takes its name from the mountain of the same name, which rises almost isolated at the southern end of the chain, limiting the Umbrian Valley to the east and dominating the wide valley and hilly landscape from its height of 1290 metres.The Park has boundaries defined by the course of the Tescio River to the North, by the Chiona River to the South-East, by the Topino River to the East and, in the South-West. An ideal line is connecting the two spurs of the Monte Subasio massif on which stand Assisi and Spello and which runs parallel to the Valle Umbra. From the morphological point of view - territorial the element that distinguishes this territory is the massif of Mount Subasio with its elliptical shape. Subasio has assumed the character of sacredness and mysticism for the Umbrian people and these elements of spirituality have been strengthened with St. Francis and the presence of his monastic order. The Canticle of the Creatures is, in fact, an extraordinary document of admiration and love for nature and Mount Subasio, with possible references to the Canticle, is also the most suitable place to create a Literary Park which can be guided by the verses of the holy fragment of Assisi. The characteristic rounded shape and the small towns of Assisi and Spello that stretch along the slopes, make Mount Subasio, easily identifiable in the panorama of the Umbrian plain, separates and connects, as a natural setting, the historic centres of Assisi, Spello, Nocera Umbrae Valtopina. The slopes of the Subasio are covered by an important tree characterised by the Olive and natural tree vegetation of Beech and Holm-oak. In the Park area, there are villages, fortresses, bridges and fountains. Churches, sanctuaries, convents, abbeys, oratories, newsstands that increase the historical and architectural value of the territory. The succession of all these small but important works, set in a frame of strong agricultural and rural connotations, is one of the major tourist attractions of the area. The Park of Mount Subasio, being one of the Umbrian areas where the path is more developed, for its geomorphological characteristics and also for the favourable conditions of the air currents, lends itself to the practice of various activities such as paragliding, horse trekking, mountain biking and hiking in general. Among the aims of the Park of Mount Subasio are the conservation, defence and restoration of the landscape and the environment to make proper use of the territory for recreational, cultural, social, educational and scientific purposes. Moreover, for the qualification and enhancement of resources and the local economy, and since ancient times, the slopes of Mount Subasio were inhabited by man. There are two most important settlements and specifically Assisi and Spello, which have documented Roman origins but with numerous traces of previous populations (Umbrians). Therefore, in the territory of Mount Subasio, history, nature and culture merge. The Park of Mount Subasio is in fact characterised by heritage with strong connotations not only naturalistic but also anthropic, rich in ancient traditions, natural beauty, artistic-architectural, spiritual and religious values; in it. Therefore, nature is well combined with a human presence more than a thousand years that has left many testimonies. St. Francis has given it a perennial fame extended throughout the world, which adds to that of the incomparable treasures of art that adorn the churches of Assisi. The charm of its streets and squares, the views overlooking the plain, the Sacred Convent and the Basilica, the Hermitage of the Prisons closed between holm oaks and oaks, the ancient Convent of St. Damian. Umbria encloses in a relatively small territory an artistic and cultural heritage of great importance. Itineraries and art routes, churches, palaces, buildings, abbeys, monuments, routes to follow for the charm of the history that has characterised this region. A millennial culture that is still present with architectural testimonies that mark the passage of ancient peoples and great cultures. One of the smallest regions of Italy preserves intact the evident traces of its past. Perugia and all the other Umbrian cities are able to offer visitors a rich artistic and cultural heritage, immersed in a landscape that still fascinates and preserves something ancient and struggles to combat industrialisation and the ugliness of progress. Umbria is the region where folklore events, fairs and traditional festivals take on a very special meaning: they preserve the diversity, localism and traditions that globalised civilisation tends to destroy. The Subasio is the "Mount of Assisi" because Assisi and its mountain live together in a sort of symbiosis that has been handed down since ancient times and that, through the centuries, has been strengthened and rooted. The entire historic centre of Assisi is included in the park and characterises the natural and cultural-historical values. The city is built with pink stone from its mountain, and the Subasio has a geomorphological balance, and a wildlife and vegetation value determined, first of all, by the fact that Assisi was the mountain from which it drew all its resources: from stone materials to wood to grazing products. Assisi, an Umbrian acropolis and later an important Roman municipality, began to outline its structure precisely on that of a Roman city with the terraces of the slope, the square of the forum to which the main streets were connected and which still faces the Temple of Minerva. On the ruins of the Roman buildings arose, in the early Middle Ages the inhabited nuclei within the walled city. After the fall of the Roman Empire, it suffered the damages of the barbarian invasions. Around the year 1000, thanks to the development of monastic movements, in particular, the Benedictines, and to the new political condition of a free and independent Commune, Assisi experienced a period of prosperity and economic and demographic recovery. In 1182 St. Francis was born, the most famous seated citizen in the world, who was proclaimed a saint in 1228, only two years after his death. From this moment on, the history of the city enters by right into the history of Italy and the world and the Franciscan movement will soon have universal diffusion. Many monuments and works of art are dedicated to the Poverello of Assisi, attracting a large number of pilgrims and tourists from all over the world. The Basilica of San Francesco, in fact, is a treasure chest of masterpieces linked above all to the pictorial magisterium of Cimabue, Giotto, Simone Martini and Pietro Lorenzetti. The name of Assisi is linked to another great religious figure: St. Clare, founder of the "Poor Clares." In addition to the attention to monuments traditionally important and fascinating (the Basilica of St. Francis, the Cathedral of St. Rufin, St. Clare, St. Peter, St. Damian, the Temple of Minerva, the Hermitage of Prisons) in Assisi you must take a walk through the streets of the old town. In every season, with the wind that noises in winter, with the balconies in bloom, from the first days of spring until late summer, in the narrow streets of Assisi you can rediscover the medieval environment with the facades of the fourteenth-fourteenth century pink stone of Subasio. The short stairways, the balconies and every now and then a view of the green plain below. Pope John Paul II has elected the City of Assisi Capital of Peace and Dialogue. Also, Assisi has been declared a World Heritage Site by UNESCO. The limestone blocks with which Gubbio was built, give the village the appellation of "grey city": it is the most ancient centre of Umbria that has preserved, both in the buildings and in the streets, its medieval aspect. A worthy citizen of Umbria, Gubbio presents a landscape as uniform as it is sublime: a landscape that is repetitive but wonderful. Like Assisi, the history of this other city is closely linked to the figure of St. Francis and in particular to the encounter with the wolf. The Church of St. Francis is the place where the wolf took refuge to spend the night and is just one of the things that you can visit. Starting from Piazza Grande, the main centre of the city, a tour of the monuments, from the Palazzo dei Consolial Palazzo del Capitolo to the Duomo and the Church of Santa Maria dei Servi, will allow you to learn about the history and legends of Gubbio. Elegant medieval town, one of the most fascinating destinations in Umbria, Todi rises austere and melancholic on the top of a hill overlooking the beautiful Tiber valley. Strolling through the streets of Todi, you can let yourself be captivated by the charm of a city where you can still breathe an atmosphere of yesteryear. In Piazza del Popolo, the ancient seat of the Roman forum, you can visit the main monuments of Todi: the Cathedral, the Palazzo dei Priori, the Palazzo del Capitano and the Palazzo del Popolo. Also in this square, you can alternate the cultural visit with pleasant stops in some cafeteria or in one of the typical shops to buy handmade fabrics. Do not forget the wine tradition of Todi: wine has always been the undisputed protagonist of the life of the Todi people. Capital of the province of the same name and of the region Umbria. It is a city of art rich in history and monuments, it is a cultural and economic centre of the region and a destination for tourists and students. It is home, in fact, to two universities: the University of Studies, founded in 1308, and the University for Foreigners, the largest in Italy. City with a noble past located on the hill of Sant'Elia enjoys a privileged position in the upper Umbria. It is one of the oldest towns in Umbria, already inhabited since prehistoric times. Its nucleus was founded by the Umbrians around 1000 B.C., but the fortune for the town arrived only with the Roman Empire when, in 241 B.C., it became a colony of the Empire with the name of Spoletium. A trip to Spoleto should also include one of the festivals dedicated to typical Umbrian products: wine, oil, cold cuts and pasta with truffle, but also some musical evenings for the Festival dei Due Mondi, which takes place every year between June and July. 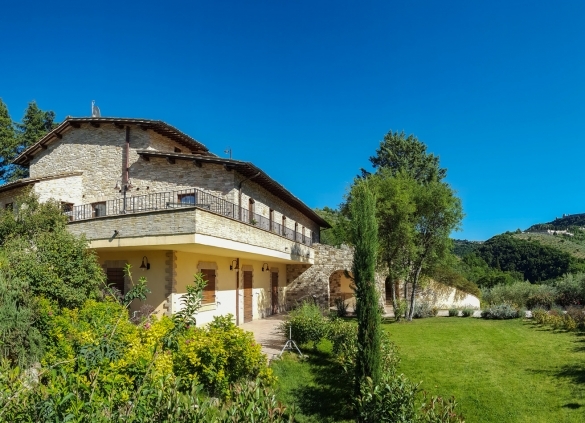 Montefalco is situated in a panoramic position, overlooking the plains of Topino and Clitunno. For this favourable position, it is called "the railing of Umbria". The reference point of the wine region where Sagrantino di Montefalco and Montefalco Rosso are produced. The Bosco di San Francesco (inaugurated in November 2011) is a huge area of about 64 hectares of land and is the most important restoration of the F.A.I. landscape. It consists of wooded land, cultivated fields, clearings and some critical architectural elements, such as the recovery of the Ponte dei Galli, the Church of Santa Croce, the restoration of the seventeenth-century fresco depicting a cross without the body of Christ, the remains of the Benedictine Monastery and the fourteenth-century tower. The site is a common natural landscape to be lived physically and spiritually as it traces the places where St. Francis dedicated himself to contemplation and unequivocally confirms the intimate relationship between human beings and nature. Inside it has been recovered some routes, others traced from scratch as the path from the Upper Square of the Basilica of St. Francis. And descends to the Complex of Santa Croce (through the Forest of St. Francis), and pores climb up the Valley of the Skull returning along the opposite bank of the stream to the mill. Also of extreme beauty is the work of Land Art "The Third Paradise" by the artist Michelangelo Pistoletto. The work, using space and natural elements as specific materials, immediately pushes the visitor of Bosco to an inner journey because the latter takes "silently" awareness of the harmony between man and our "Mother Earth". The great artist has depicted "The Third Paradise" with the shape of the mathematical sign of infinity to which is added a third circle to join the two opposing circles signifying nature and artifice. The symbol of infinity is the reflection of the spirit in the created world, of the immeasurable and the indefinable. It, therefore, calls for research and the discovery of transcendence. The project of the "Third Paradise" is a beautiful challenge, as it necessarily obliges the human being to assume personal and direct responsibility and therefore a change of individual conscience to restore life to the "Earth".